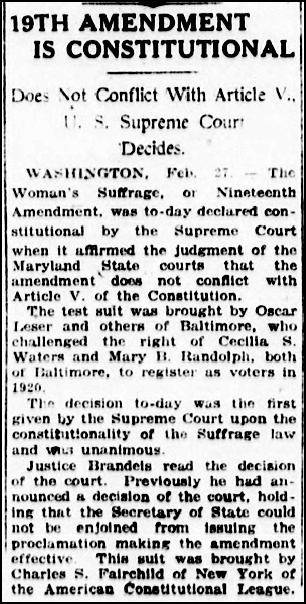 It wasn’t all that long ago, really — just a mere 91 years ago today — that the right of women to vote in the United States hung in the balance. Now there’s not a lot known about any of the players here. There’s no white woman named Cecilia Street Waters who can be found in Baltimore’s 11th Ward in 1920 census, no articles online detailing her life, not one single family tree posted online claiming descent from or even collateral relation to her that The Legal Genealogist could find in a quick survey. The 1920 census offers two candidates for the Mary Randolph of the case. One was a 34-year-old restaurant worker, a married woman but living with her brother.4 The other was a 25-year-old maid living with her husband, a stevedore on the docks, as lodgers in a rented house in the 11th ward.5 And, of course, she might not have been recorded on the census at all. Did they know, either of them, that their names would be passed down through the years as the women whose simple act of registering to vote would prove so pivotal? Maybe, but probably not. We just don’t have enough information to make a guess as to whether they expected to be so bitterly fought. And Leser appealed again. That brought the case to and left the decision entirely in the hands of a group of men. Nine of them, to be exact. All members of the United States Supreme Court. Nine men. From the fiercely liberal Brandeis to the equally fiercely conservative Day. Not a woman in the bunch. And 91 years ago today, those men issued their decision. Thank you, Cecilia Street Waters. Thank you, Mary D. Randolph. And thank you to nine men, all born in the 19th century, who saw clearly what the 20th century required of them. For what their 21st century descendants enjoy. 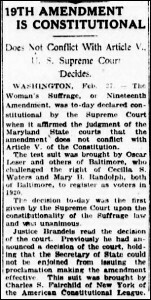 Image: “19th Amendment is Constitutional,” The (New York) Evening World, 27 February 1922, p. 1, col. 5; digital images, “Chronicling America: Historic American Newspapers,” Library of Congress, (http://chroniclingamerica.loc.gov/ : accessed 26 Feb 2013). Cecelia Waters is enumerated in the 11th ward in Baltimore in the 1900 and 1910 census. In 1900 Cecelia S Waters born June 1858 in Maryland is widowed and living with her stepmother Mary Ann Forbes on Howard Street. She is a dress maker. In 1910 she and her stepmother are lodgers living on W. Preston Street in Baltimore. Cecelia S Waters is an embroiderer working from home. Images accessed from Ancestry.com. Thanks for that additional information, Beth! We can hope this is the right Cecilia Waters, but more research would have to be done to be sure. Love your blog. I love this blog post very much! A well written tale with law, history and genealogy interwoven marvelously. I am a genealogist and my wife is finishing her law degree so this appeals to us both. It is mostly about Polish Genealogy (written under my nom de guerre, STANCZYK, who an historical jester at the Polish court). From time to time, I delve into history or politics or culture (think WDYTYA). Keep up your great work. I learned about your blog from an e-newsletter, Gen-Dobry. Wow, Michael, you’re so kind to say so! Good luck to you both — you on your blog (I’ll check it out!) and your wife on her law degree!